Michael Hoey in action during last season’s Irish Open in Killarney. Credit: golffile.ieWho else but Michael Hoey could use words like crazy, weird, ugly, strange and lucky to describe a brilliantly resilient two-shot victory in the Madeira Islands Open? The quixotic and wildly talented, 32-year old Ulsterman has always been Irish golf’s mystery man. But following his second European Tour win and his fifth as a professional, you get the impression that he is finally about to live up to his massive potential. Two years after his win in the Estoril Portuguese Open, Hoey closed with a 71 at the Seve Ballesteros designed Porto Santo Golfe to win on 10 under par and take his career earnings close to €1 million. Level with Jamie Elson starting the day, he began with seen straight pars and then birdied the par-five eighth to take control before a dropped a shot at the 13th sewed some seeds of doubt. England’s Chris Gane was pressing hard but Hoey kept his head, picking up a birdie at the 14th to take a stranglehold on the tournament before grinding out four solid pars to finish. “It was just very very tough,” he said afterwards. “I had to dig really deep, especially after I hit one in the rocks on 13, and I thought ‘that’s it now, I’ve thrown this thing away completely’. “It’s a crazy game. But I somehow managed to make a good swing on the third shot, and holed the putt for bogey, which was huge, it kept me in it. Then I birdied the next, and just parred in after that. The main thing was my putting, I made virtually all the six to seven footers on the way in. “It’s weird, because I think everyone was struggling a bit. If someone had really gone out there and shot a good score, then they could have got to maybe 11 or 12 under, or maybe even better, but nobody did that. Sometimes that happens on the final day and it’s quite an ugly win, it was kind of quite ugly today. So I’m lucky to come out on top. “I guess I knew I had a good chance this week. The last two years I finished sixth both times, and I knew I was putting better and chipping better this year. Elson (73) and Gane (71) finished tied for second on eight under with Glasson’s Colm Moriarty clinching his best finsh in a European Tour event after a closing 70 gave him a share of seventh place on five under par and a cheque for €18,060. 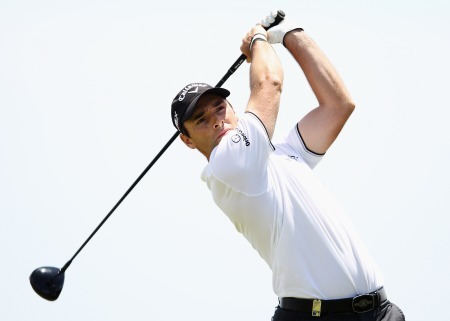 Hoey earned €116,660 to move up 60 places to 49th in the Race to Dubai rankings, earning a one-year exemption until the end of 2012 and his place in all the the big limited field events that will be played in Asia towards the end of the season. Hoey’s win was the second successive victory by a player from Northern Ireland following Darren Clarke’s triumph in the Iberdrola Open in Mallorca the previous Sunday. 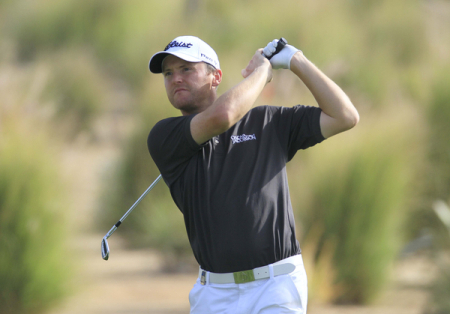 It was also Hoey’s fifth win as a professional following Challenge Tour victories in Austria, Italy and Morocco in 2005, 2007 and 2008 respectively. Royal County Down’s Simon Thornton, who led the tournament at halfway before slipping to a third round 77, finished tied for 27th after a 73. Michael Hoey produced a scintillating exhibition with his irons to grab the halfway lead in the Madeira Islands Open. Irish duo Damien McGrane and Michael Hoey will try to chase down budding superstar Estanislao Goya in the final round of the Madeira Islands Open BPI-Portugal. Oliver Wilson is chasing his maiden tour win in Madeira. ©Getty ImagesGlasson’s Colm Moriarty missed the cut by a shot as Ryder Cup player Oliver Wilson fired a seven under 65 in the Madeira Islands Open - Portugal to lead a European Tour event for the first time since November 2008.